EASY TO DEPLOY, HIGH PERFORMANCE, ON-COUNTER SCANNINGWhen it comes to on-counter scanning, the DS7708 offers a feature set that puts it at the top of its class for performance, ease of deployment and total cost of ownership. No matter what barcodes appear at your POS, the DS7708 can scan them all; 1D, 2D, printed and electronic.With its compact design, the DS7708 can easily be installed in even the most space constrained checkout lanes. 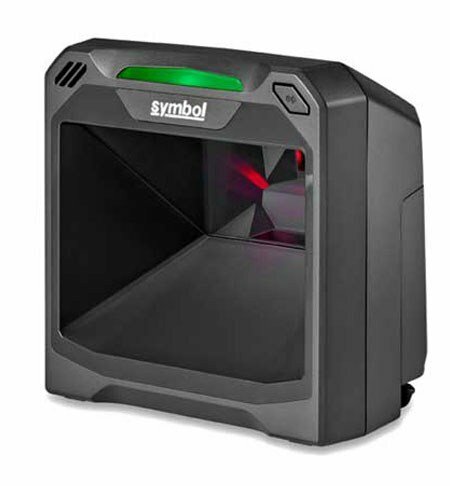 And extraordinary durability minimizes costs and protects uptime, maximizing device lifecycle and your return on investment.LARGEST FIELD OF VIEW AND OMNI-DIRECTIONAL SCANNING FOR SCANNING SIMPLICITYA field of view that is over 50 percent larger than competitive 2D imagers enables easy capture of barcodes, regardless of where they are located on an item. Scanning is truly second nature. No need to orient an item to capture the barcode.IMAGE CAPTURE SUPPORT EXPANDS FUNCTIONALITY AND INCREASES VALUEThe DS7708 offers additional data capture features to further streamline your business processes. Workers can take a picture of a check, driver’s license or I.D. card to meet store requirements or industry regulations in a split second.PRZM INTELLIGENT IMAGING TECHNOLOGY FOR NEXT GENERATION SCANNING PERFORMANCEResets the bar for 2D imaging by improving decode performance and dramatically improving the user experience, user productivity, throughput and customer wait times.Zebra DS7708 Vertical Slot ScannerSUPERIOR OUT-OF-BOX EXPERIENCESmart auto-host detect cables automatically determine which interface is attached, eliminating the need to scan numerous configuration barcodes. Over 90 international keyboards are supported, enabling easy setup, all around the world. Coduri de bară liniare (1D) suportate Codabar,Code 11,Code 128,Code 39,Code 93,EAN-13,Interleaved 2 of 5,MSI,Plessey,U.P.C.